This week has been crazy. I had my birthday on Monday, started a new job as a visual effects artist, and now my cartoons have been turned into greeting cards. 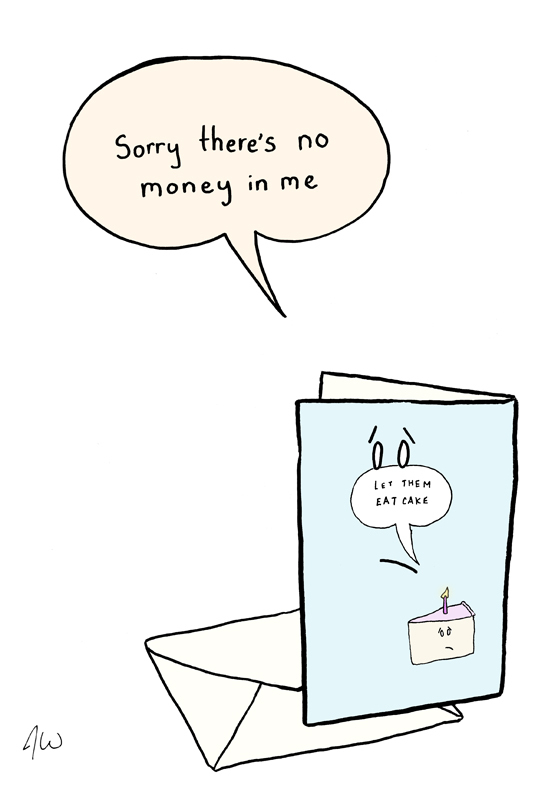 That’s right, Open Me is now featuring my sad cartoons on their greeting cards. In case you’ve never heard of it, Open Me is a website that allows you to purchase greeting cards, sign, and send them without leaving you house (Wall-e is coming true). Finally no more terrible Garfield cards and having to buy an entire book of forever stamps when you only need one. So wether you need to get a card for someone’s birthday, to wish them a “Merry Christmas”, or to wish them well in a recovery, Open Me (and my sad cartoons) have you covered. This entry was posted in Uncategorized and tagged birthday, Garfield, get well soon, Greeting card, Merry Christmas, Open Me, sadsadsad. Bookmark the permalink.